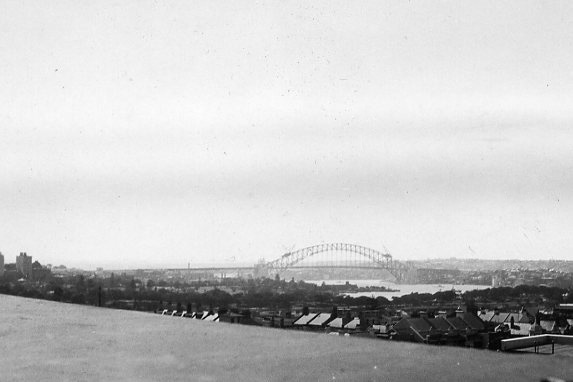 The 1930s were the time of the Great Depression which saw significant unemployment and hardship in Australia. HAP admitted that he and his friends, all with relatively well-off parents, were largely unaffected (apart from the adjustment to his expectations mentioned at the end of the last chapter), and that this period was their heyday. 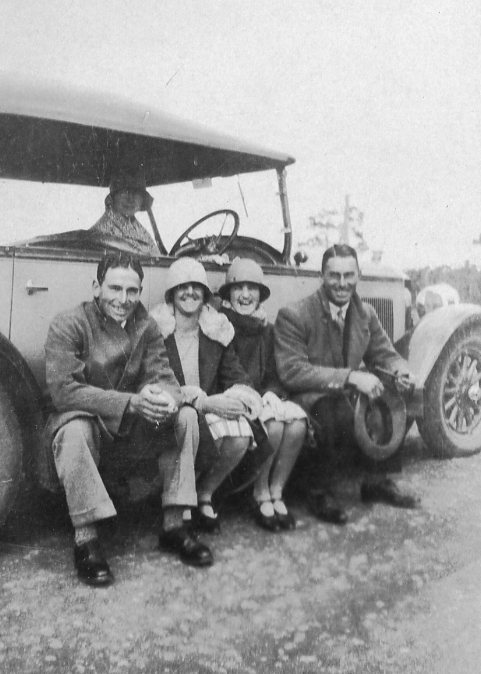 Harold was home at “Quinira” in Ringwood again after his stint as a jackaroo, and in January 1931 acquired a new car, a Singer, and drove his father Archibald to various towns around Victoria on business for Stratton’s Flour Mills of which Archie was the Managing Director. 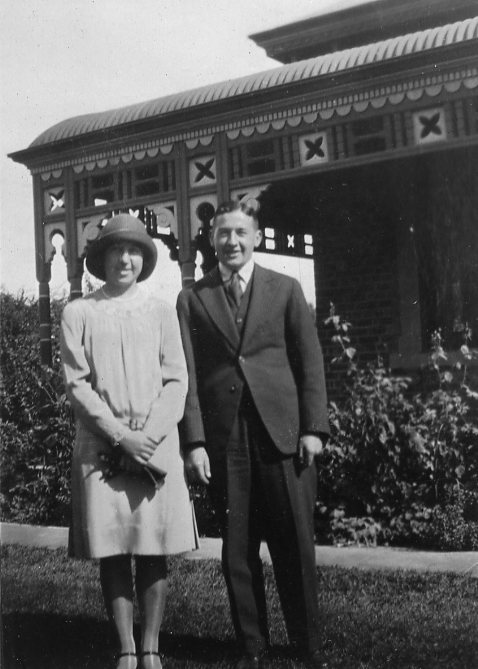 In February 1932, Harold started a new job with Elcon as an apprentice Engineer while he studied Engineering, probably at the Melbourne Technical College, which later became the RMIT. 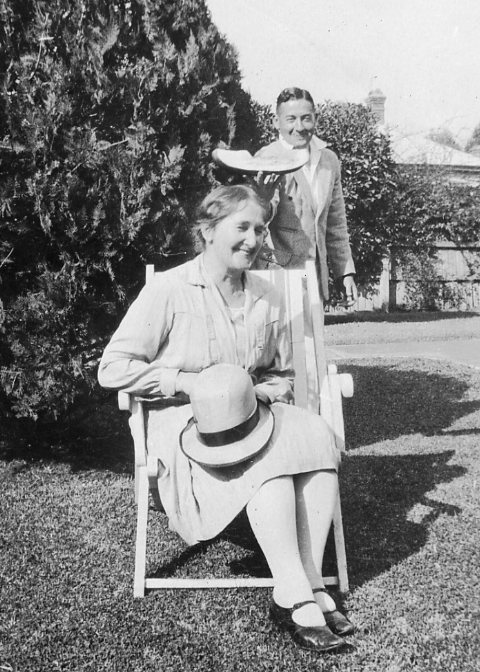 15 Jan 1931 Hilda Forster returned from 15 months overseas during which she stayed with her older brother Harold Forster in Leigh-on-Sea, Essex, and met his wife Maud and sons Geoffrey and Michael. 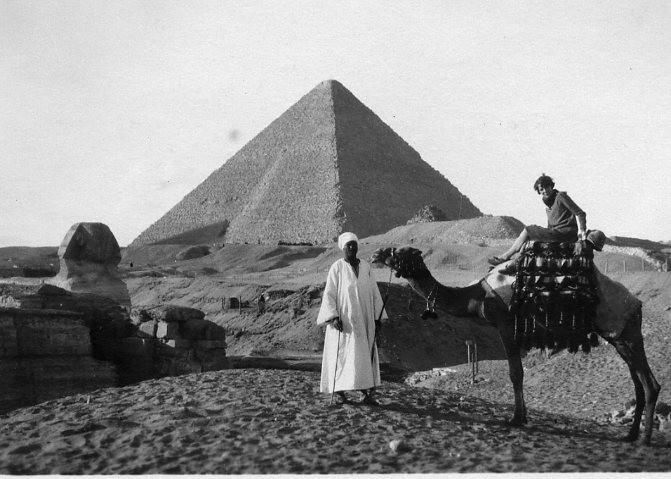 She also travelled in France, Spain, Germany and Italy. 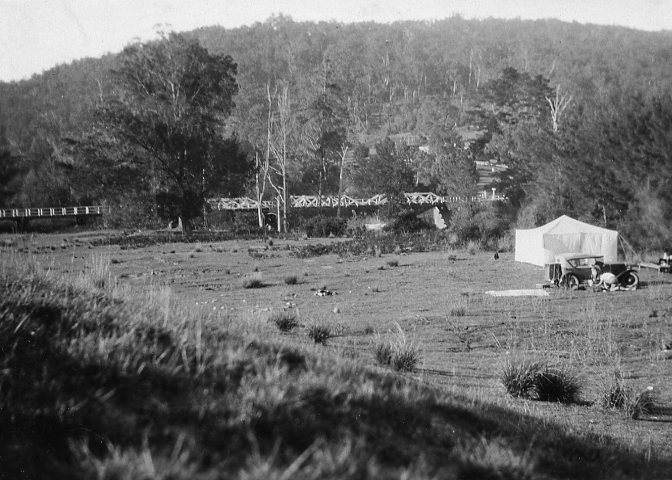 Her letters home had been typed up and copies distributed, including to Harold at Jemalong Station. Peg Beatty was given her second car, a Reo Flying Cloud which helped her to keep up with her many friends, especially her old school chums. 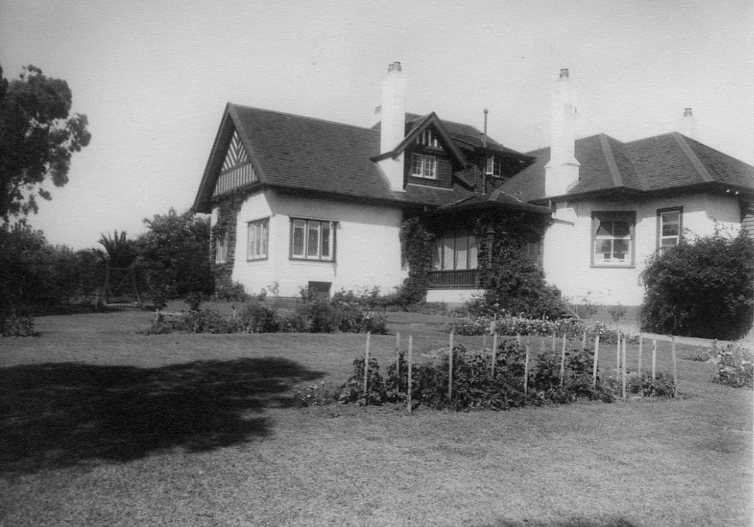 As well as Win and Nell Atkins in Terang, she exchanged long visits with Jean Hawthorne whose family home was “Strathclyde”, Kerang, and with Jean Coutts of “Plaistow” at Joyce’s Creek. 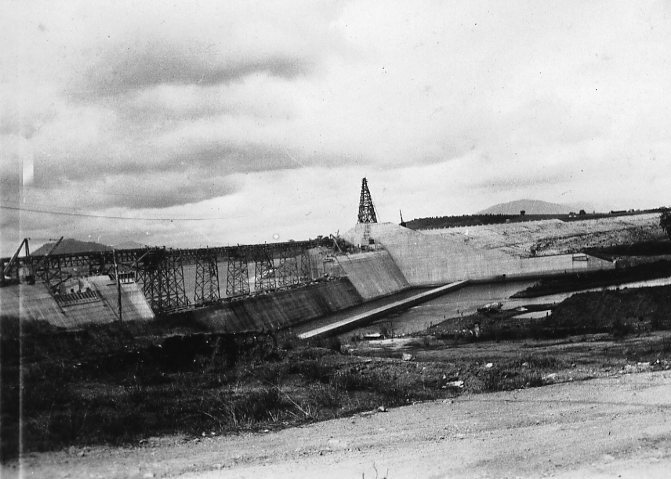 It is very hard to select just a sample from the dozens of (mostly unlabelled) photos in Peg’s albums. 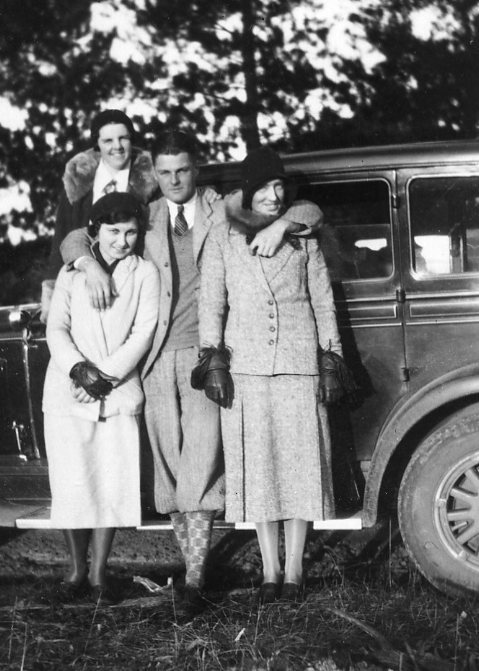 Peg and Harold were still close friends with the Blairs and with their Littleton cousins. 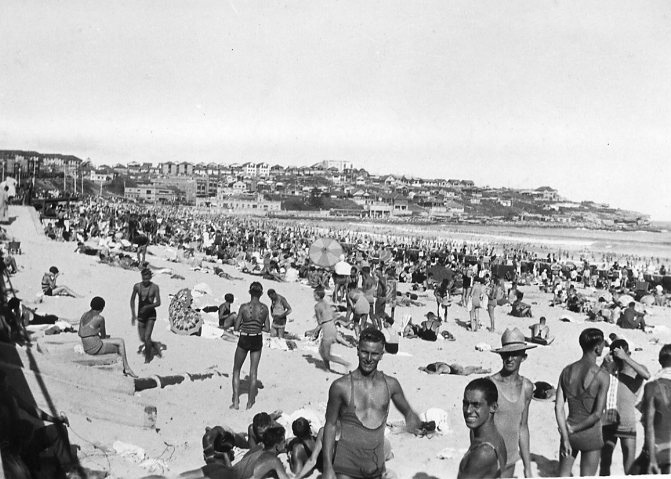 Peg’s diary of this period mentions many picnics, visits to beaches, outings to the cinema, “lunch at Robur Tea”, bridge parties, tennis, “Oriental for supper and dancing”. 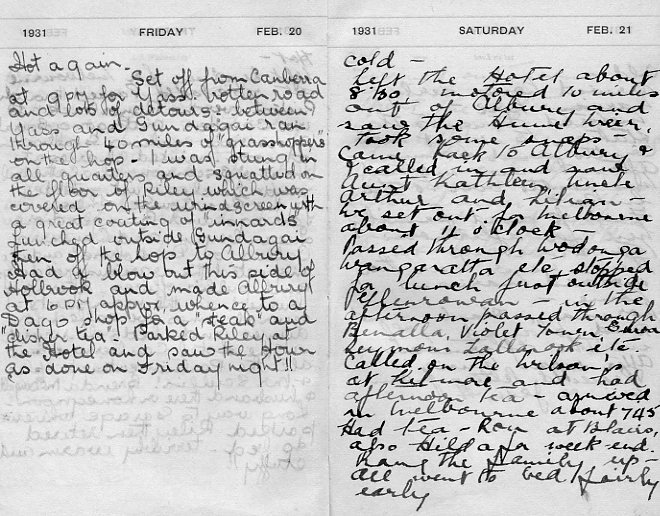 Last two days of Sydney trip in Peg Beatty’s diary. Entry for Feb 20 written by Winifred Blair. 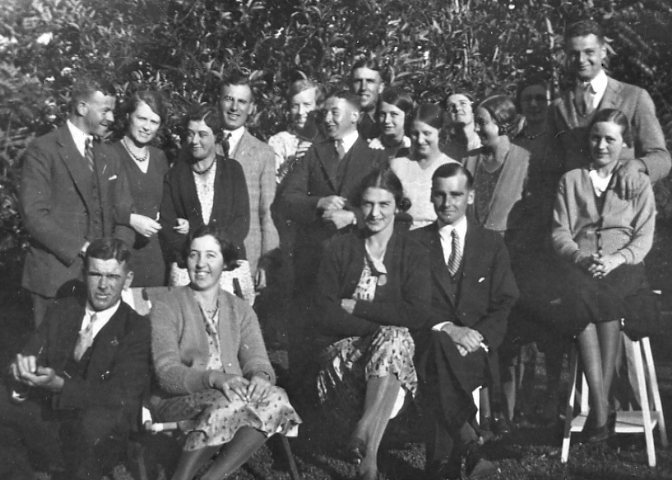 A major change of residence was undertaken in January 1932 when the Beattys moved from “Quinira” in Ringwood Street, Ringwood to 15 Trafalgar Street, Mont Albert. Archie Beatty named their spacious new home “Enniscrone” after his birthplace in Ireland. 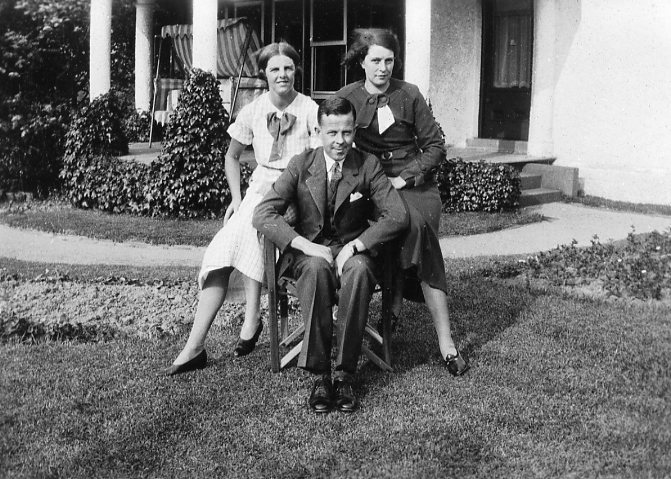 Constance and Peg visited showrooms and auctions to buy mahogany furniture and Indian rugs. 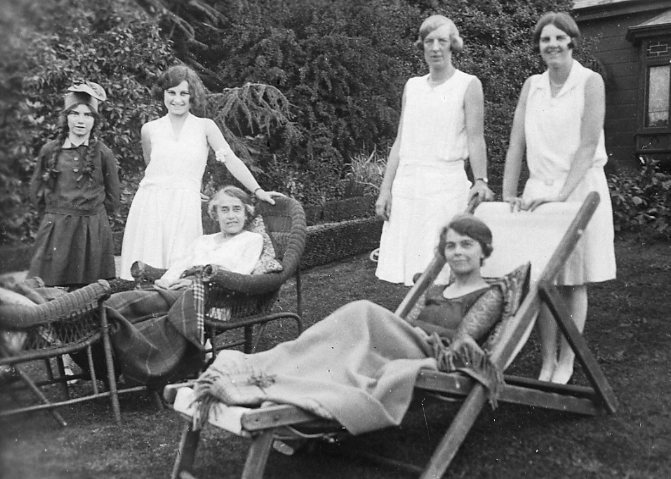 Con’s Lady Companion Ada Wadelton and Emily (cook and household help?) came with them. 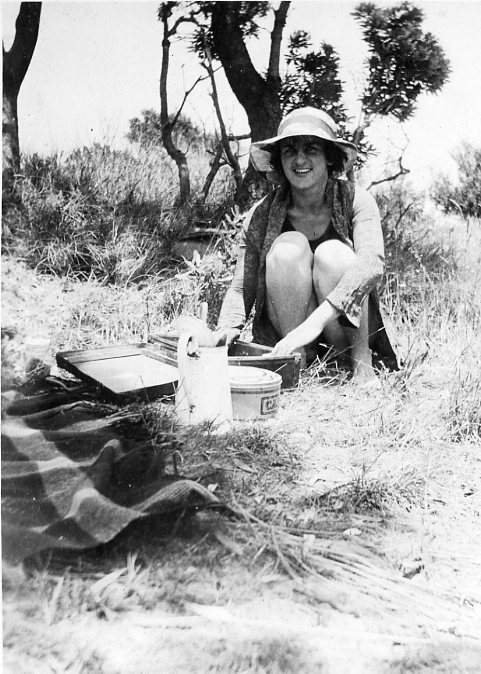 Hilda Forster frequently stayed the weekend. 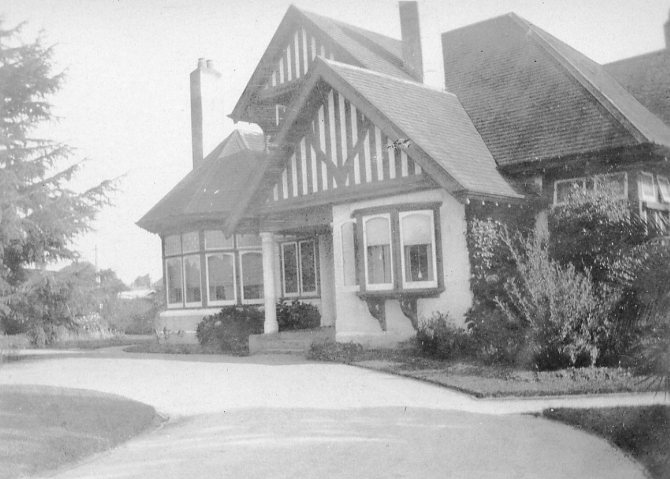 Just over the road was “Athol”, the home of close family friends the Blairs. 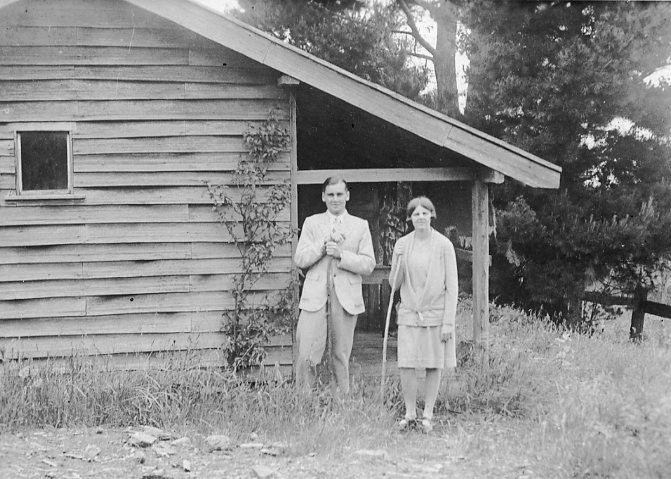 At Easter “everybody” would go to stay with the Hawthornes in Kerang. 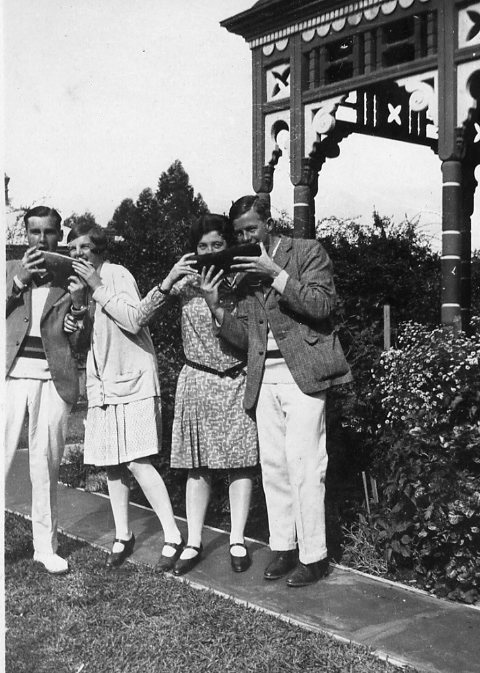 Easter 1931 Peg Beatty, Winifred Blair, Geoff Littleton and Ron Vial went down to Dromana instead. Harold drove up to Kerang for the gathering though with Norm and Win Atkins. There he met Betty Reid and was smitten. They went out several times over the next few weeks and were soon deeply in love. 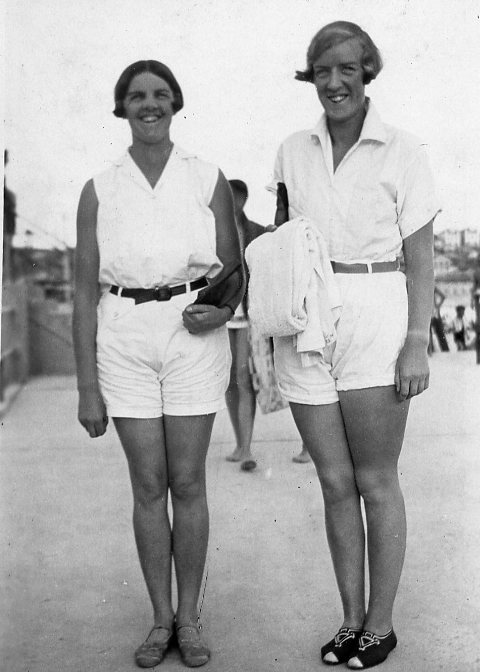 Some years earlier Betty and Peg had been schoolgirls at Fintona at the same time though not in the same year. 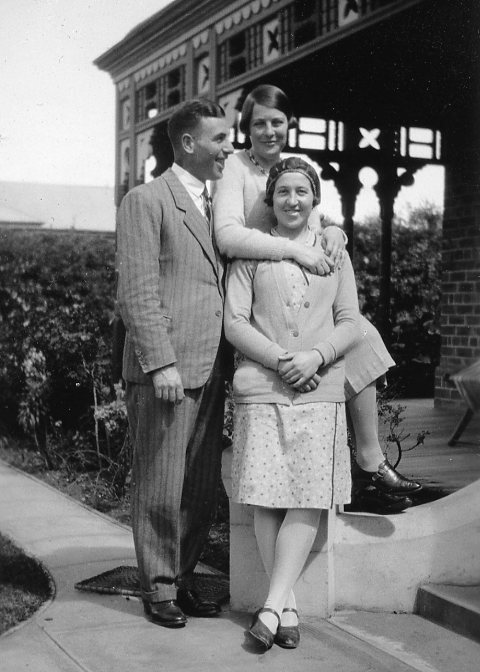 Betty, having seen Harold at a school function, had said to Peg “I’m going to marry your brother!” Peg told me that at the time she had thought “Not if I can help it!” although later they got on well. 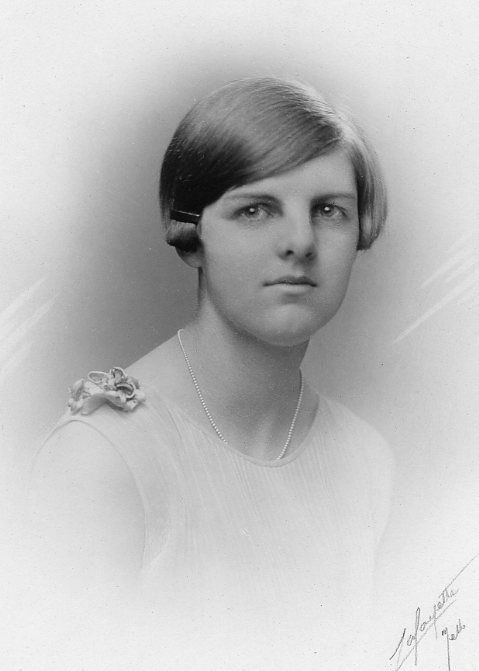 Harold’s fascination was understandable as Betty was a very beautiful young woman and was the subject of at least one portrait by a well-known artist. Peg noted 6th May 1933 that at the 20 Artists exhibition there was “an excellent portrait of Betty by Charles Wheeler”. Harold’s wallet from the 1930s contains a newspaper clipping “Blonde beauty – Charles Wheeler at the top of his game is represented by the portrait of a slender and graceful blonde. It is remarkable for the natural and vivacious pose of the beautiful sitter”. All the same, Betty and Harold had to overcome some initial opposition from his parents. 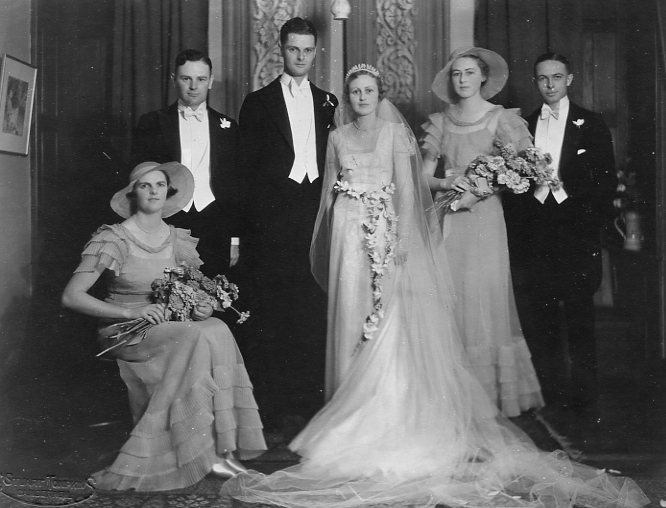 They had hoped that Harold would marry Cherry Singleton whose father was a friend of Archie’s, and Constance is said to have responded to the news of Harold’s choice with “Oh not that miserable little thing!” Harold was in a quandary. He consulted his friend Paul Haege. “What should I do? Cherry is such a good golfer!” His friend’s advice was decisive. “You don’t play much golf in bed Old Boy!” At the end of May Harold went to explain to Cherry and in January 1932 Harold and Betty announced their engagement. Peg had many close friends, but her most intimate friend since their schooldays was Win Atkins. They exchanged letters at least twice per week. 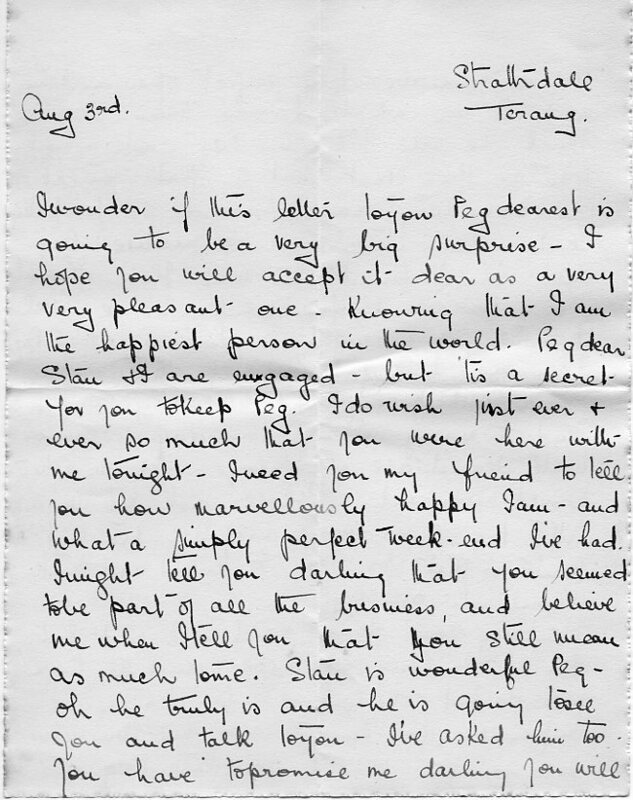 In early August 1931 Peg received an anxious letter from Win. She and Stan Hawthorne were in love and about to announce their engagement, and Win was afraid that Peg might not be pleased! “I know for my sake you will be a brick Dear” she wrote. She needn’t have worried. Peg and Win continued as lifelong good friends. In April of the same year Winifred Blair became engaged to Ron Vial. 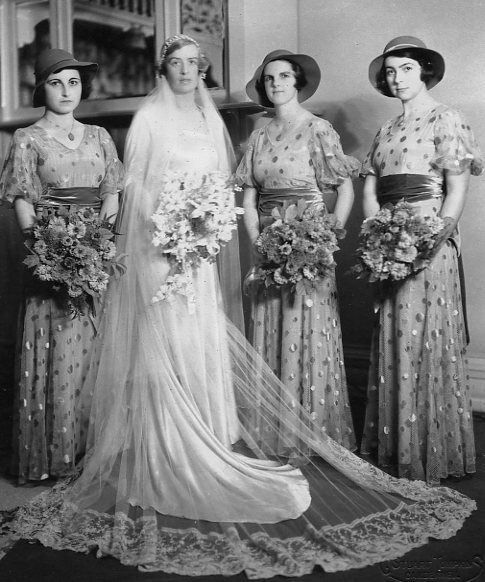 All three weddings took place in 1933 and Peg was a bridesmaid at each. 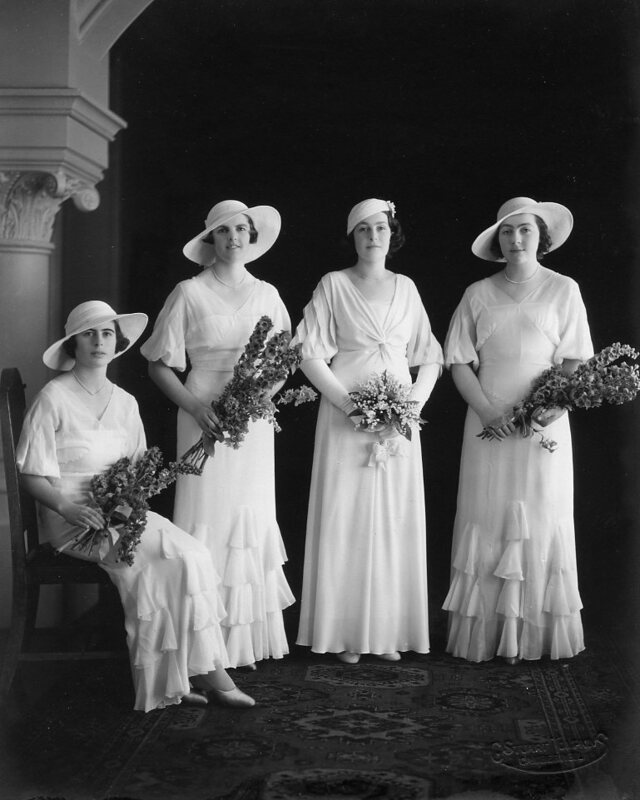 Wedding of Winifred Blair and Ronald Vial, 7 April 1933 at Scots Church, Melbourne: L to R: Ruth Littleton; Winifred; Peggy Beatty; unknown. 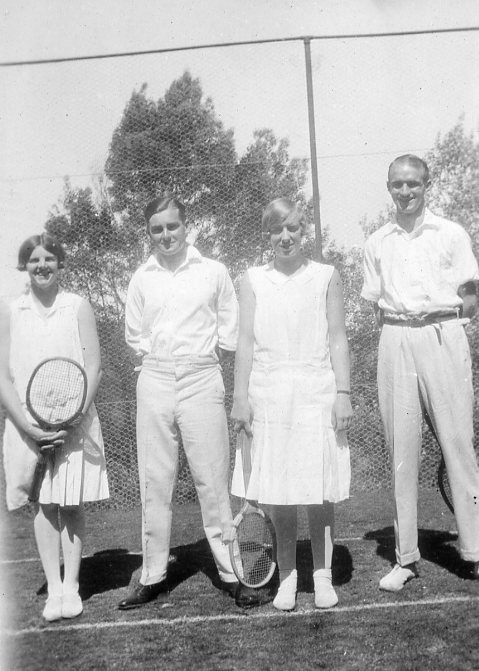 Harold and Peg were both good at tennis, and most house parties involved tennis games. Their other major sporting interest was golf. 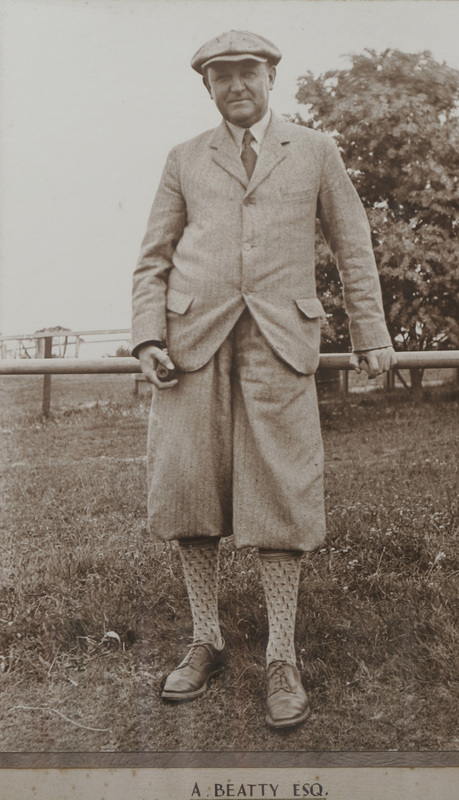 Archie had been a member of the founding committee of the Croydon Golf Club in 1925 and he, Harold and Peg spent increasing amounts of time at the links improving their game and reducing their handicaps. 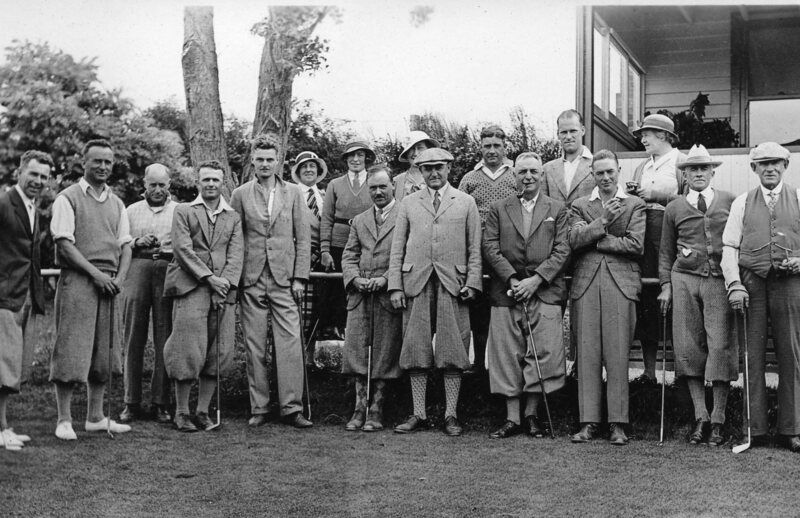 Peg’s diary records many competitions with trophies won (or just missed) by one or other of them, and comments such as “I played a truly shocking game!” 31 Oct 1931 Harold won one event, was 2nd in two others and his handicap was reduced to 8. 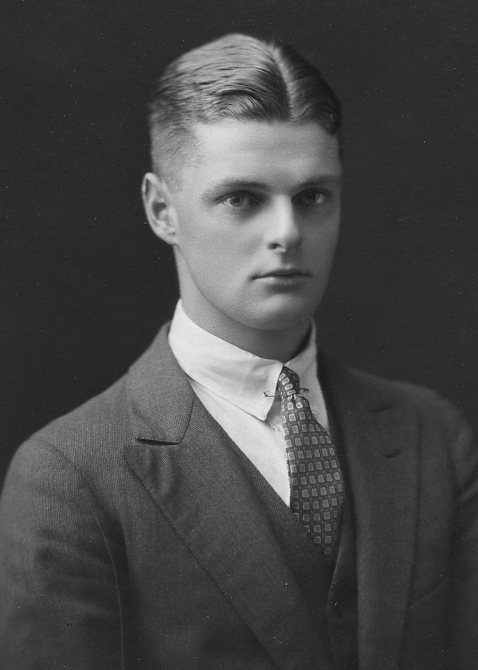 On 11 Nov 1932 Archie was elected club president. Both Archie and Harold were made life members, which still meant a lot to Harold 60 years later. 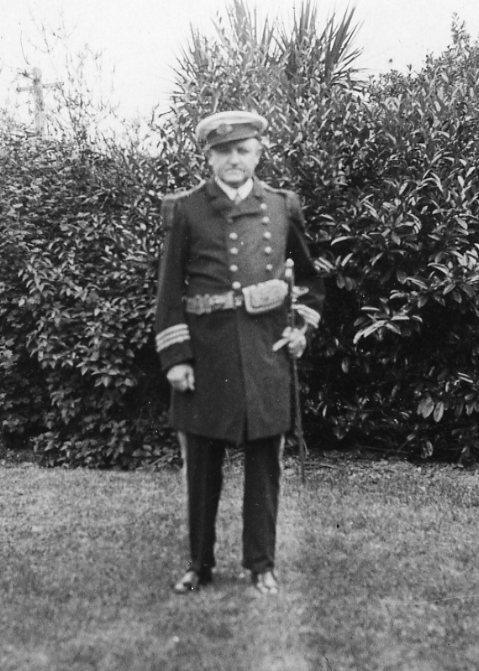 Archie was always fun loving and he decided (Beatty not being a very common name in Melbourne at the time) that the famous Admiral Beatty must be a relation. Well, he was Irish too! 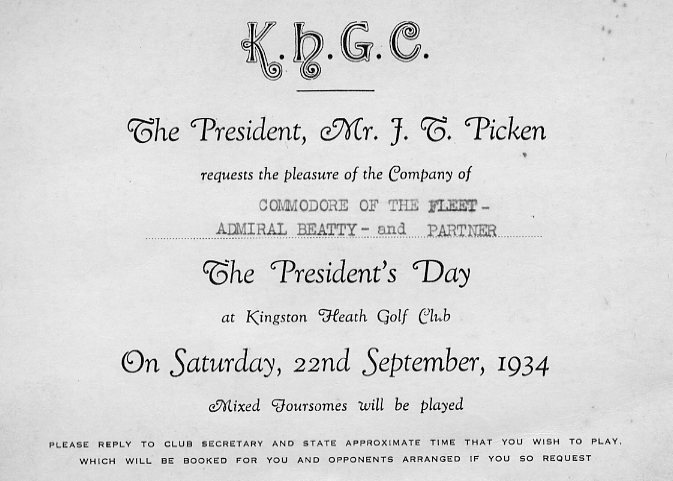 Archie’s invitation to the President’s Day of Kingston Heath Golf Club 22 Sept 1934 is addressed to “Commodore of the Fleet – Admiral Beatty” and Peg records 16 Nov 1934 that he attended the Croydon Golf Club Ball in Admiral’s uniform. 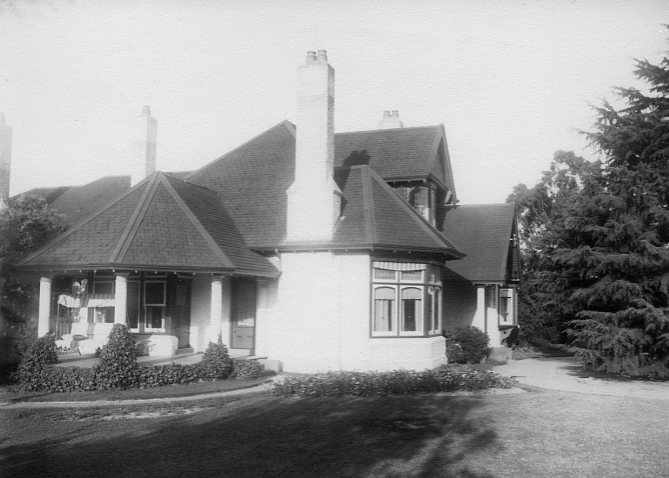 Croydon Golf Club early 1930s. 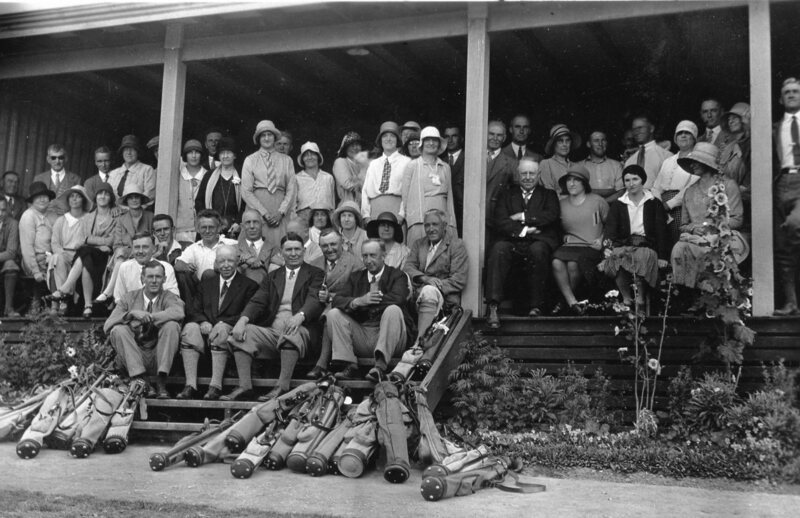 Archibald Beatty 2nd from right in front row with pipe in hand leaning forward. 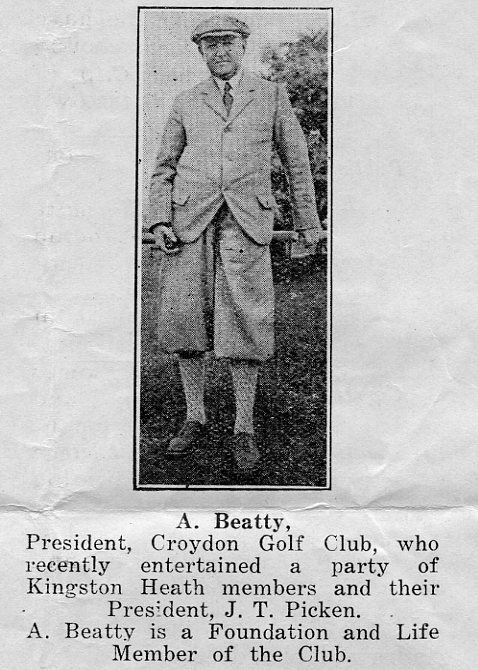 At Croydon Golf Club 1934. 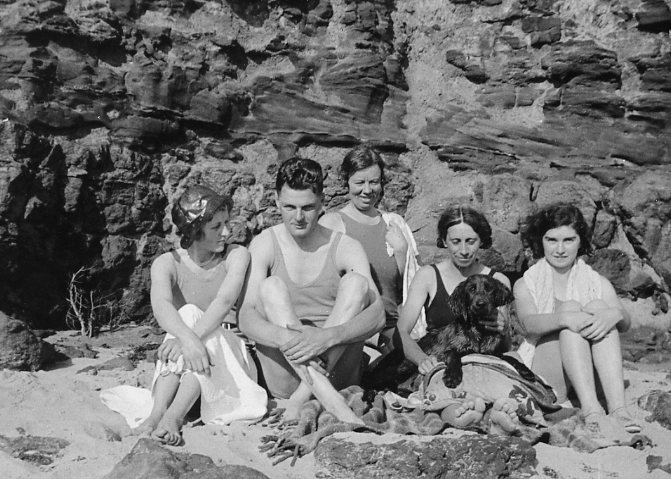 Harold Beatty 5th from left, Archie Beatty at centre. 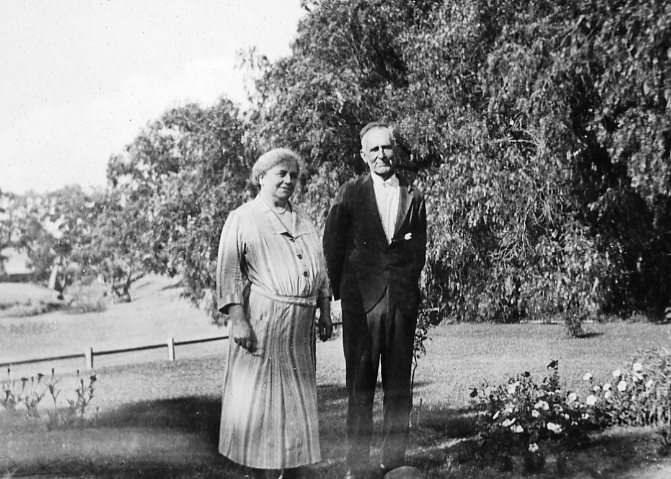 Some other family comings and goings: In April 1933 Uncle Jim Beatty and Beatrice (Beatrice Constance Jordan, Peg’s cousin?) 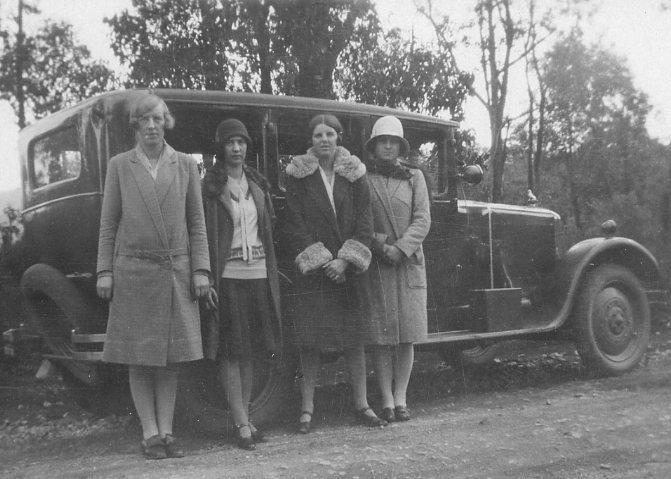 visited; In June 1933 Sturdie Oldham left Tubbo Station to be Overseer at Goolgumbla Station, Jerilderie; In July 1933 Peg went on a New Hebrides cruise and while in Sydney visited Forster relations Aunt Mabel, Aunt Ruby and Kathleen (Peg’s cousin Kathleen “Jum” Barker); In November 1933 “Gordon Beatty Junior” (Gordon Edward or “Gordo”) stayed with the Beattys in Mont Albert while looking for a job; 21 April 1935 all three of Archie’s brothers, Peg and Harold’s Uncles Jim, Charles Gordon and Alf Beatty visited for a Beatty brothers reunion after many years. As it turned out, this was the last time they were all together. Sources: Mostly Peg Beatty’s diary and photos, also Hilda Forster’s letters, other family documents and reminiscences of Harold and Peg Beatty. Wonderful research. What an amazing project. Well done. Lovely to read of Enniscrone links. Well done. Gosh thanks Terry! I’m still determined to track down the Beattys in Ireland.